The result of going to a new car cast such a pall over the paddock and blogosphere that the entire world was certain that there would be no more than a little over 20 cars on the grid at St. Pete. Conventional wisdom said that the current economy would not support very much sponsorship dollars. Coupled with the fact that the gorilla in the room was taking all the available sponsor dollars to NASCAR would render the IICS a second or even third tier sport. Not even a lower chassis cost, roughly down to about one third the current cost, will create much participant demand. 2. Newman Haas Racing is poised for a break out year and return to glory with the seasoned Servia guiding the Rookie of the Year James Hinchcliff. The team not only finished strong, but their presence in the public conscious was elevated by the dynamic Hinchcliff. With his stage presence and Servia’s girlfriend’s looks; simply cannot miss! Blogsters are literally foaming at the mouth and required a fresh set of drawers at the prospects for the 2012 Newman Haas season. This is a team with an absolutely storied history of involvement in American open wheel racing. 3. DRR is going to enjoy a very productive and competitive year with the return of a healthy Justin Wilson. Once the team decided to make some serious changes amongst its engineering staff, they give all indication that they are bringing in new talent to help JWill get back into winning form. All they need is to get over the hump a bit on the engineering side, and the new car will make most everybody start on a clean sheet of paper. 4. Mike Conway, along with Marco Andretti and Ryan Hunter Reay and Danica will make for a strong team in the paddock. Even if the rumors about Danica going tin top racing prove to be true, a certain Indy 500 winner would make a fine addition to the team and show Marco how to win with calmness and patience. All this team is lacking is a leader to become the anticipated powerhouse and start to live up to expectations. 5. There will finally be a balance of ovals and twistys again! No more 5+5+5 style of tracks in the mix. A true, 9+9 ovals/twistys looks like it is on the horizon. Randy Bernard is talking to a ton of tracks to finally bring the vocal minority their wish and a return to the glory days of American oval racing. Rumors of a return to New Hampshire, finding a sponsor and promoter for the Milwaukee Mile, along with the great finish at Kentucky must have track owners salivating to obtain an Indy CAR Show for their own venue. 6. Three solid engine manufacturers only have to produce engines for six or seven teams apiece. Since there is finally going to be competition among engine suppliers, they will not have to crank out blocks and pistons on short notice and every team will get a shot at the supplier of their choice. With the return of the bowtie and Lotus, it looks like some of the pressure will be taken off the shoulders of Honda Performance Development. This will lead to the possibility of the little teams finally getting one over on the big boys, for a while, at least. Ah, peace and harmony in the paddock! 7. Formula One drivers are too weenie to drive in the IZOD Indy Car Series. Michael Schumacher was asked if he would race in the Indy 500 someday. He deemed it too dangerous and not all that difficult a challenge. Even the F-1 cast offs would not consider taking on such a dangerous form of motorsport. Almost every driver asked about Indy Car said they had no desire to run in the series, even after their hugely successful careers in F-1 came to an end. It remains to be seen if the current challenges facing Randy and company can be overcome. This is by far a watershed year for the series with far more questions than answers and not a single team is going to sleep very well for the next few weeks. Will Ed get a Honda? Will Tracy really end up with Michael Shank Racing, fresh off their Rolex win? If David can slay Goliath in that venue, then why not in Indy Car? 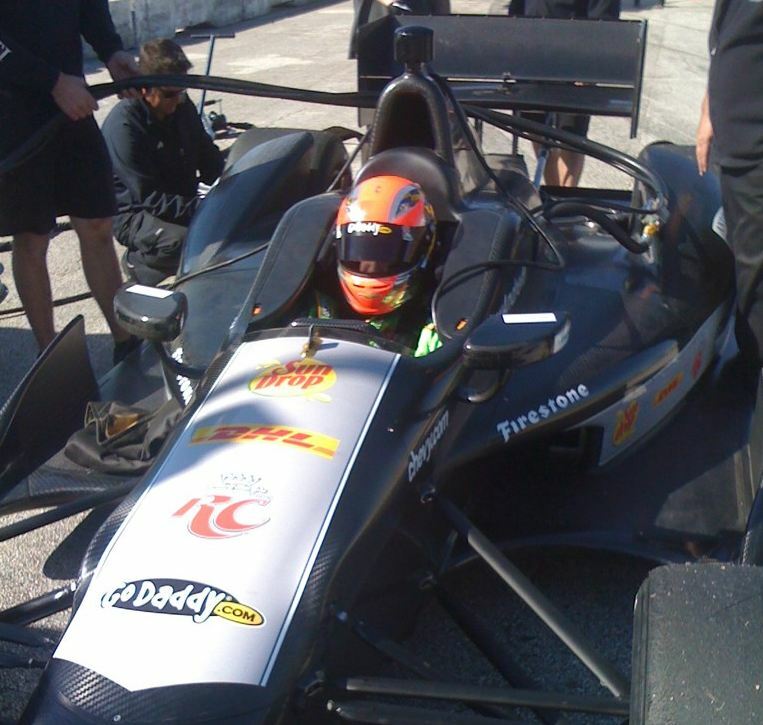 The start of the second work week of the New Year means we are one week closer to the launch of the 2012 IZOD Indy Car Series at St. Petersburg, Florida. I can feel the semi tropical breezes in my face, mixed with the distinct aroma of methanol. Man, am I getting geeked! It should be a year of leveling the playing field to some extent, as a direct by product of introducing a new vehicle. Sadly, it is again a mere “spec” car and not really a result of innovation. Say that word s l o w l y; very slowly and sound it out, class. I N N O V A T I O N…. Back in the day, and no, I do not mean back when I had hair on my head; I mean wayyyy back in the 60’s, Indy Car was all about innovation. This was the very reason that lead to the development of the Hallowed Ground as it became more than just an idea, conjured up by Carl Fisher and his drinking pals. The Indianapolis Motor Speedway came to be as a proving grounds for the recently launched automobile industry. This is IMS History 101, folks. Do not let this point be lost on you. Indy was all about innovation and development. Speed was a very nice by product, which lead to the gearhead nation that we have become today. In 1963 the first rear engine cars began to show up at the speedway, compliments of a Brit named Colin Chapman. This lead to the modern, rear engine design that prevails today. What? You say that I am incorrect? That the very first rear engine vehicle showed up back in 1939? Uh, well, you are quite correct! That year, Hudson Motor Company test driver George Bailey showed up with a very expensive car called the Gulf-Miller. It featured a rear engine, disc brakes AND four wheel drive! The car qualified on the grid in sixth position with a speed of 125.821mph. The car did 47 laps and retired with a valve problem. Sadly, George Bailey perished in a practice crash the next year at Indy. This sets the table for our discussion of the arrival of one of the most controversial cars to ever show up at Indy. I would like you to meet Silent Sam, AKA the STP-Paxton Turbocar. The STP-Paxton Turbocar was built around an aluminum box-shaped backbone. The driver was seated on the right side of the backbone, while the engine, a Pratt & Whitney Canada ST6B-62 turbine engine, was mounted on the left side of the backbone. Though never successful as an automobile powerplant, the small aircraft engine it was based on would become one of the most popular turboprop aircraft engines in history. The engine drove a Ferguson 4-wheel drive system, which transmitted the power to the wheels. A torque converter eliminated the need for a clutch pedal and gearshift. The engine idled at 54% of full throttle, which meant that the driver didn’t even have to press the accelerator pedal to pull away; all he had to do was ease his foot off the brake pedal. A movable panel was mounted behind the cockpit, which acted as an airbrake. The suspension’s coil springs were located inside the backbone and the suspension A-frames had airfoil cross-sections. The car weighed 1,750 pounds, a few hundred pounds more than the Indy minimum weight of 1,350 pounds. The turbo invasion was on like Donkey Kong! Designed by Ken Wallis, Silent Sam became the STP entry for the 1967 Indianapolis 500. Wallis, a distant relative of famed British engineer Barnes Wallis, had developed a workable plan for harnessing a gas turbine to a race car. He first presented the idea to Dan Gurney, who passed on the idea. Wallis then offered the plan to Carroll Shelby and Shelby said (according to later court testimony), “Hogwash.” Finally, Andy Granatelli of STP expressed interest in the concept. Wallis and his crew moved in with Andy’s brother Joe at STP’s Paxton division in Santa Monica, and they began work on the turbocar in January 1966. It was Granatelli who introduced a side-by-side concept—that is, putting the engine at the driver’s left. Granatelli also added four-wheel drive to the design. The aluminum frame of the car was badly warped during heat treating in early 1966, eliminating any possibility of the car racing in the 1966 Indianapolis 500. Work started over again and the car was ready for the 1967 Indianapolis 500. Parnelli Jones drove the car during tire testing in Phoenix early that year and was impressed with the car. He agreed to drive the car in the Indianapolis 500 after being offered $100,000 and half of any prize money he won. Jones qualified the car at Indianapolis in sixth place at 166.075 mph. At the start of the race, he quickly took the lead and rarely relinquished it. However, with just eight miles left to go, he coasted into the pits with a transmission bearing failure. 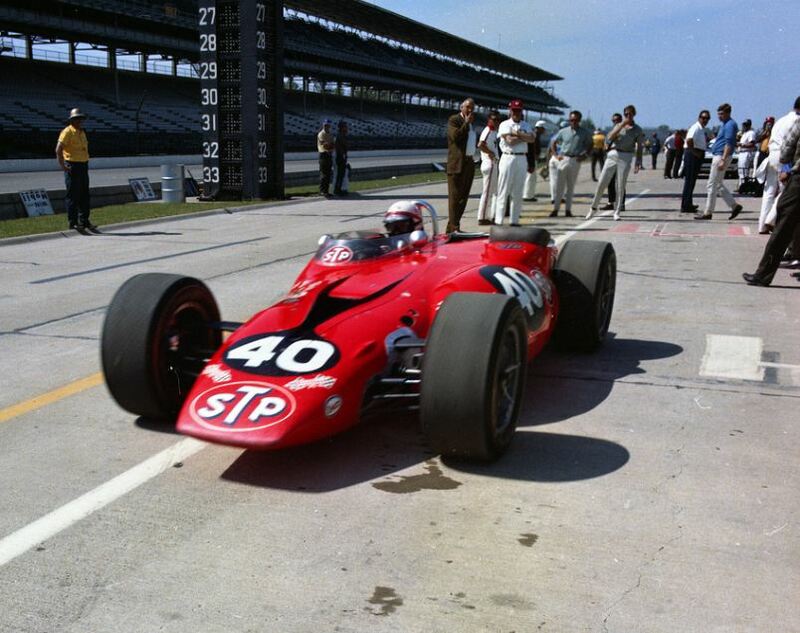 The car was refurbished and entered by STP in the 1968 Indianapolis 500. Granatelli also entered 3 newly designed wedge shaped INNOVATIVE turbine cars. Silent Sam, Driven by Joe Leonard,crashed into the wall during qualifying and never raced again. The remaining three gas turbine cars did not finish the race either. Had it in the bag....again! At the drop of the green flag, Joe Leonard in the #60 STP Turbine leaps in the lead, with Bobby Unser in second and Roger McCluskey up to third at the end of lap 1. After only nine laps, Jim Hurtubise in the PepsiCo Frito-lay special has burned a piston, and is out, finishing 30th. About this time, Bobby Unser is now hard after Leonard, and at the end of the main straightway he passes to take the lead. On lap 41, the caution flag flies for the first time when Al Unser loses a wheel and hits the first-turn wall, with Arnie Knepper and Gary Bettenhausen also involved. After 200 miles (320 km), A.J. Foyt is out with a blown engine and the defending champion’s bid for his 4th Indy win is over for this year. After 110 laps, Graham Hill loses a wheel and smashes into the turn two wall, bringing out the second caution. On lap 127, Mel Kenyon and rookie Billy Vukovich tangle in turn four. Both are able to re-enter the race, but Johnny Rutherford, trying to slow down, is rear-ended by Jim McElreath. Mike Mosley also loses it in turn four trying to avoid the mess. When Bobby Unser makes his last pit stop, his car is stuck in high gear. As he leaves his pit struggling to reach racing speed, both Leonard and Ruby pass him. With only 16 laps to go, Joe Leonard still has the #60 turbine in first place, but on the backstretch, Carl Williams hits the wall, bringing out the final caution. After cleanup, the green waves on the 191st lap. At that instant, both leader Joe Leonard in STP turbine #60 and teammate Art Pollard in STP turbine #20 lurch—and instantly slow with identical snapped fuel pump drive shafts. Unser sweeps by into the lead with Dan Gurney inheriting second place. With a nearly full-lap lead, Bobby Unser cruises the final 9 laps to win his first of eventually three Indianapolis 500 victories. The sad ending to this long history lesson leads to the title of this article; how legislation killed off innovation. USAC had limited the engine intake area to 23.999 square inches to limit the turbine’s power output, but the engine still produced 550 hp. However, drivers reported that it had a three-second throttle lag. 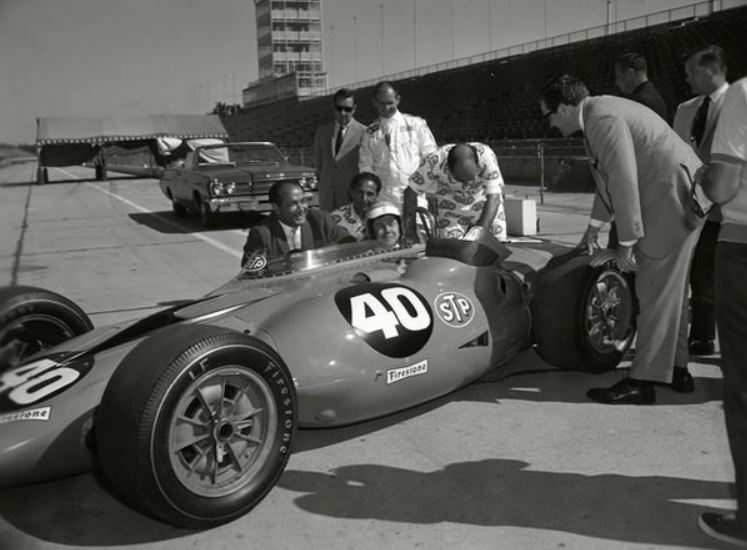 In less than a month after the 1967 Indianapolis 500, USAC cut the allowable turbine air intake area from 23.999 to 15.999 inches and imposed the ruling immediately, although it had been customary to give two years’ notice of engine changes. With the reduced inlet area, the maximum lap speed that could be achieved was 161 mph. Near the location of the Hallowed Grounds, just to the west a few miles in Danville sits a company called Avon Aero. They purchased the STP#60 original chassis and restored the car but with a slightly different gas turbine engine. Hit this link for some highly interesting photos and video links about the project! RT @ZachVeach: Please take a min. & vote 4Zach in the Champion Parts “Search for a Champion” $50k Sponsorship Contest! Did I mention that Beaux Barfield is moving to Indy? Presser to follow on 1/4/2012. Time to find the matches and light some candles!